Earlier this week, Phil Jackson described the friends and associates of LeBron James as a “posse.” Understandably, LeBron James was offended by those comments. Surprisingly enough, one of Jackson’s “employees” in Carmelo Anthony is taking James’ side. It’s not easy to understand why James was mad. After all, his business associate Maverick Carter explained why he should be in one tweet. For reference, here’s what Jackson said specifically that set off LeBron. James responded with strong comments, including some on how he didn’t think Jackson would use the word “posse” to describe a big named sports figure who isn’t African-American. On Tuesday, fellow NBA star and current New York Knick Carmelo Anthony took James’ side. “I would never want to hear that word about me and my — I don’t want to say crew — but people that I consider family or people that I come up (with), been through thick and thin with,” Anthony said. “I’d want to be called a tight-knit group or family. That’s what I consider those close people to me. Carmelo said he hadn’t read Jackson’s comments on LeBron in the original Q&A, however he was “briefed” on the matter before he spoke with the media Tuesday. Anthony went on to say a lot more about Jackson, the situation, and really took the opportunity to speak his mind. Anthony also added he didn’t think Jackson meant to use the word “posse” in a racial connotation, but also that he couldn’t speak for Jackson. He said “posse” means different things for different people, so for Jackson it might not have been used in a negative way that Carter and James might have interpreted it. The last sentence is a good point. The Knicks opened up the season against the Cavaliers back on October 25th, but haven’t faced them since. 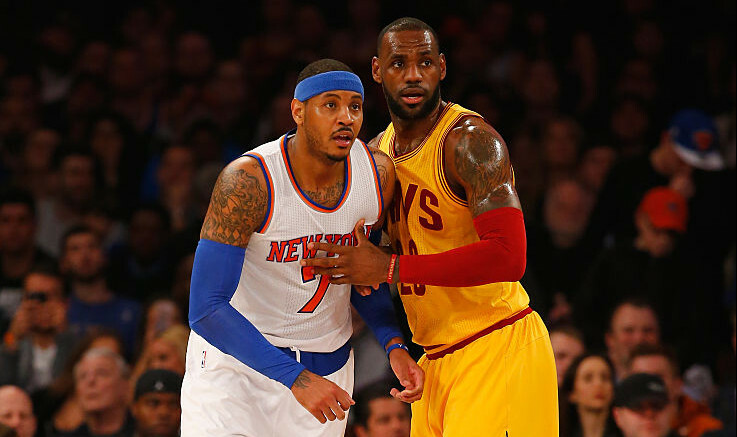 New York and Cleveland are slated to face off at Madison Square Garden next on December 7th.